Download "Kompressoren. 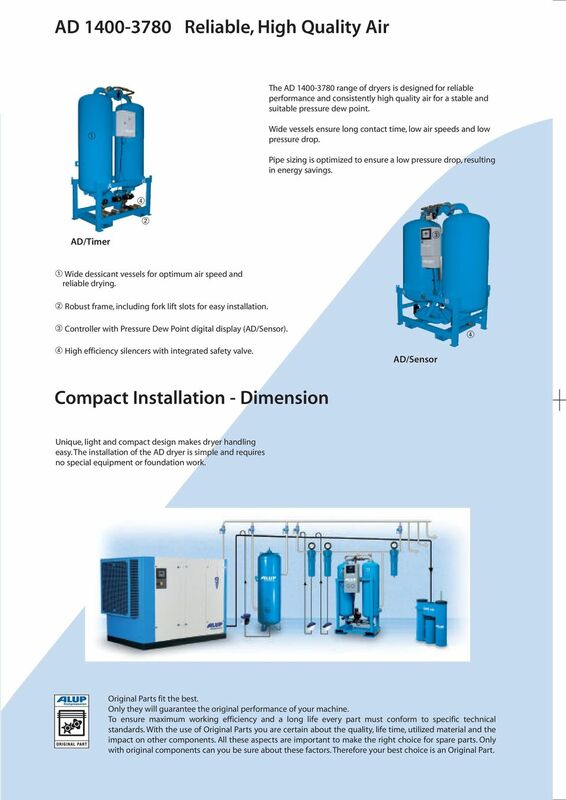 Adsorption Dryer AD"
3 Adsorption dryer AD Water vapour contained in the air is corrosive and can affect your compressed air network, solenoid valves, pneumatic equipment etc. 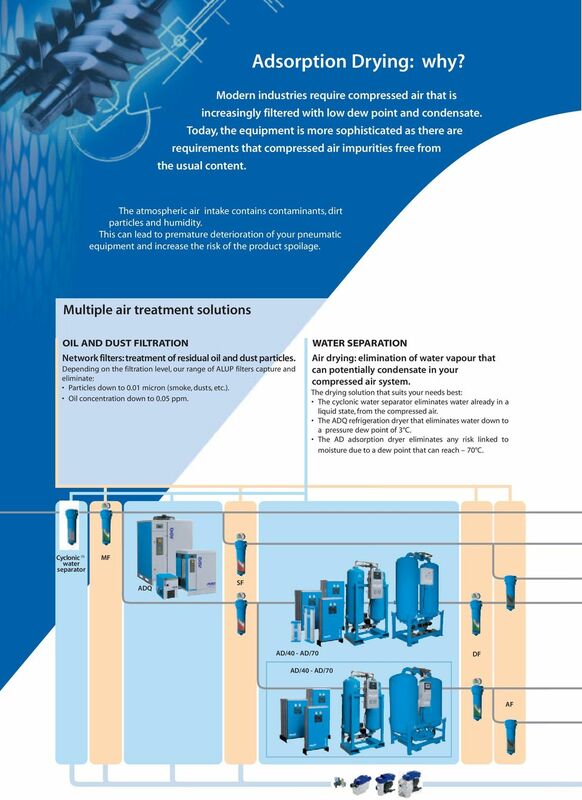 Dust and other contaminants can reduce the working life of your pneumatic equipment, resulting in premature breakdowns and higher maintenance costs. In addition, these contaminants can mix with your raw material (paint, pneumatic handling, etc. ), and increase the possibility of product spoilage. 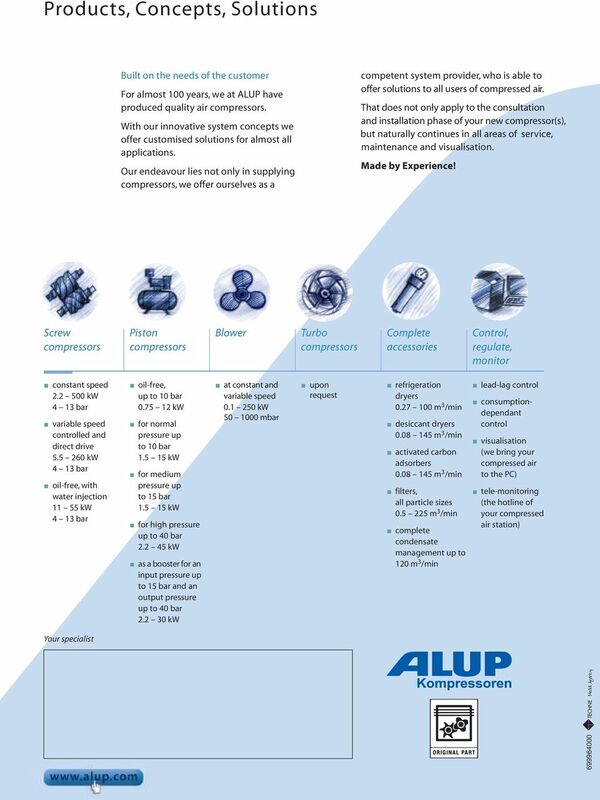 To preserve your equipment and guarantee total quality, ALUP offers a complete range of air treatment solutions. We can recommend superior air quality for less operating costs. CONDENSATE TREATMENT Our automatic drain offers you a choice of a float drain; electronic drain or a level detection drain to ensure zero air loss. 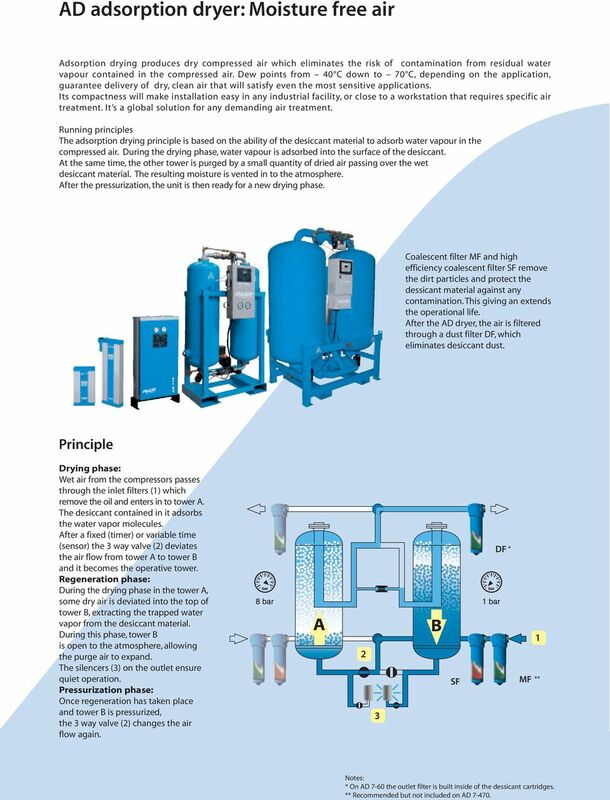 Our OWS condensate treatment range will collect and treat all your condensate. 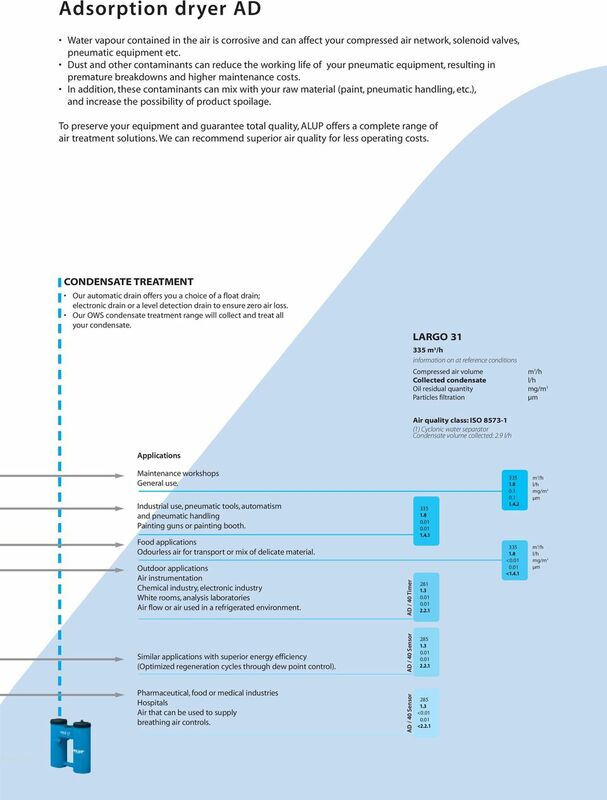 LARGO m 3 /h information on at reference conditions Compressed air volume m 3 /h Collected condensate l/h Oil residual quantity mg/m 3 Particles filtration µm Air quality class: ISO () Cyclonic water separator Condensate volume collected: 2.9 l/h Applications Maintenance workshops General use. Industrial use, pneumatic tools, automatism and pneumatic handling Painting guns or painting booth. Food applications Odourless air for transport or mix of delicate material. Outdoor applications Air instrumentation Chemical industry, electronic industry White rooms, analysis laboratories Air flow or air used in a refrigerated environment. AD / 40 Timer < <.4. m 3 /h l/h mg/m 3 µm m 3 /h l/h mg/m 3 µm Similar applications with superior energy efficiency (Optimized regeneration cycles through dew point control). 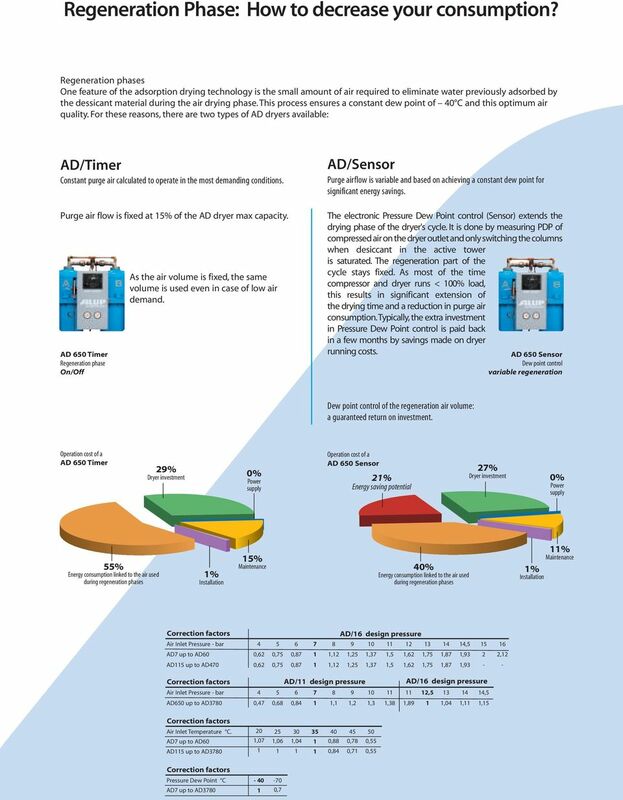 AD / 40 Sensor Pharmaceutical, food or medical industries Hospitals Air that can be used to supply breathing air controls. AD / 40 Sensor < <2.2. 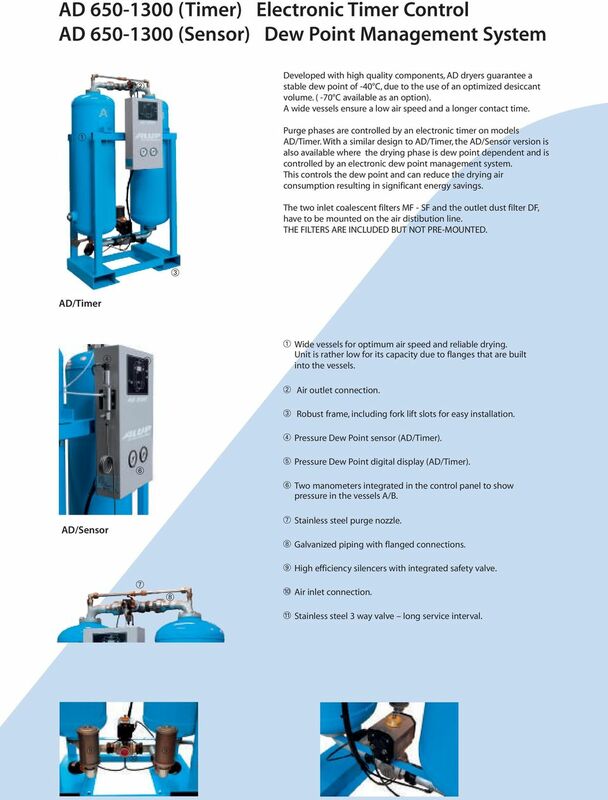 6 AD Reliable, High Quality Air The AD range of dryers is designed for reliable performance and consistently high quality air for a stable and suitable pressure dew point. Wide vessels ensure long contact time, low air speeds and low pressure drop. Pipe sizing is optimized to ensure a low pressure drop, resulting in energy savings. 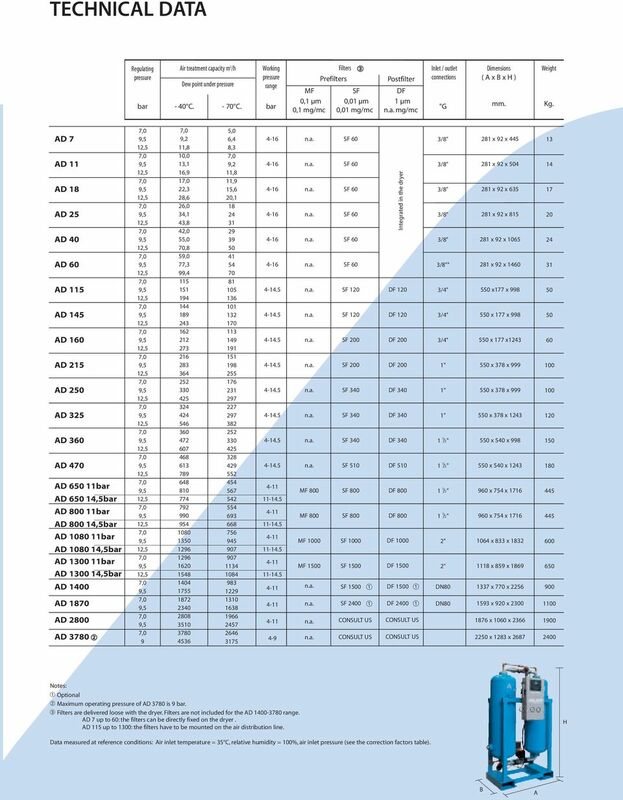 AD/Timer Wide dessicant vessels for optimum air speed and reliable drying. 2 Robust frame, including fork lift slots for easy installation. 3 Controller with Pressure Dew Point digital display (AD/Sensor). 4 High efficiency silencers with integrated safety valve. AD/Sensor 4 Compact Installation - Dimension Unique, light and compact design makes dryer handling easy. 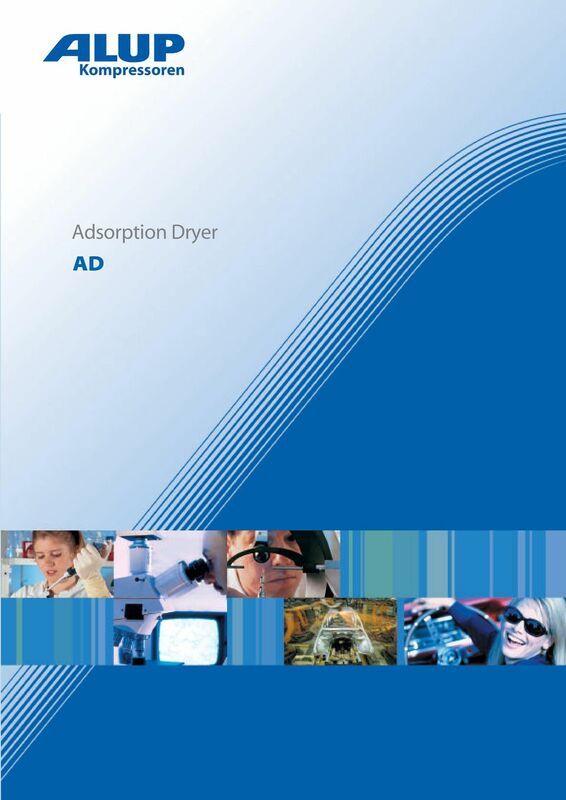 The installation of the AD dryer is simple and requires no special equipment or foundation work. Original Parts fit the best. Only they will guarantee the original performance of your machine. To ensure maximum working efficiency and a long life every part must conform to specific technical standards. With the use of Original Parts you are certain about the quality, life time, utilized material and the impact on other components. All these aspects are important to make the right choice for spare parts. Only with original components can you be sure about these factors. Therefore your best choice is an Original Part. 7 AD 7-60 Timer Compact to extend installation possibilities Compact, this module can be installed horizontally or vertically, can stand on the floor or be mounted on a wall (optional mounting kit available). Its compact design reduces installation space and the installation costs. The inlet high efficiency coalescent filter SF can be mounted directly on the unit, the outlet dust filter DF is built into the cartridges. Enclosed in a canopy, all dryer components are well protected. Standard dew point is 40 C but can be set at 70 C by derating the FAD. The max. pressure is 6 bar. Multiport inlet and outlet; this arrangement ensures easy and fast installation Electronic control: Regeneration cycle management Regulation status Default diagnosis Remote default report Easy and quick maintenance due to the use of desiccant cartridges. A sub micronic filter cartridge is included separately. 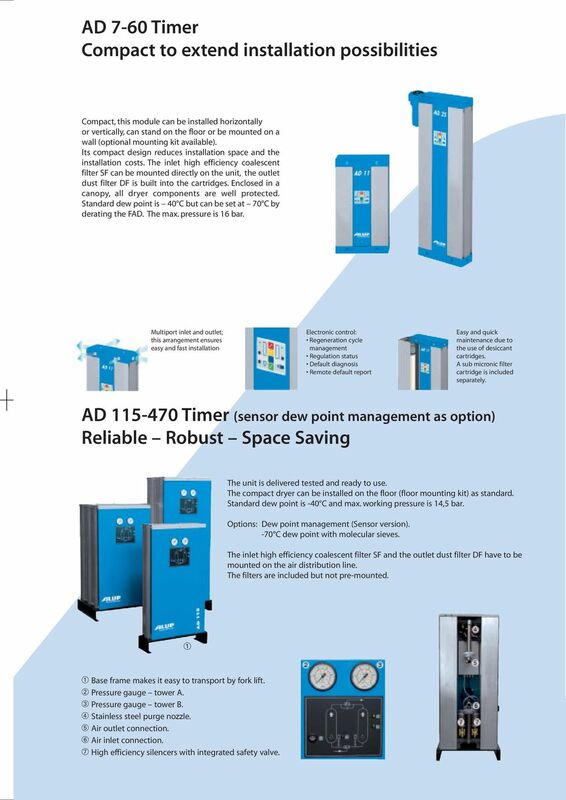 AD Timer (sensor dew point management as option) Reliable Robust Space Saving The unit is delivered tested and ready to use. The compact dryer can be installed on the floor (floor mounting kit) as standard. Standard dew point is -40 C and max. working pressure is 4,5 bar. Options: Dew point management (Sensor version). -70 C dew point with molecular sieves. The inlet high efficiency coalescent filter SF and the outlet dust filter DF have to be mounted on the air distribution line. The filters are included but not pre-mounted. Base frame makes it easy to transport by fork lift. 2 Pressure gauge tower A. 3 Pressure gauge tower B. 4 Stainless steel purge nozzle. 5 Air outlet connection. 6 Air inlet connection. 7 High efficiency silencers with integrated safety valve. Regenerative Desiccant Dryers. KAD, KED, KBD, and Hybritec Series.